In this article, you will learn how to build a resource allocation model in Excel using the solver. Our motto is always making the best uses of available resources with the highest output. We’re going to solve a problem that is ideal for Solver. Ideal problems for Solver involve optimizing the volumes of individual production units that depend on varying amounts of fixed resources. The following figure shows a simplified example of a toy company. This toy company makes five different toys. These toys use six different materials in varying amounts. For example, Toy E uses 3 units of red paint, 0 unit of blue paint, 2 units of white paint, 1 unit of plastic, and 5 units of wood, and 3 units of glue. Column G shows the current inventory of each type of material. Row 10 shows the unit profit for each toy. The company also must ensure that the quantities produced aren’t negative. This can be accomplished by specifying the Make Unconstrained Variables Non-Negative option. Fill Set Objective field with this value: $B$13. Select the radio button of the Max option in To control. Select cell $B$11 to $F$11 to fill the field By Changing Variable Cells. This field will show then $B$11:$F$11. Add constraints one by one. The constraints are: $I$4>=0, $I$5>=0, $I$6>=0, $I$7>=0, $I$8>=0, $I$9>=0. These constraints will be shown in the Subject to the Constraints field. Click this article to know more about adding constraints. Select Simplex LP from the Select a Solving Method drop-down list. Now click the Solve button. 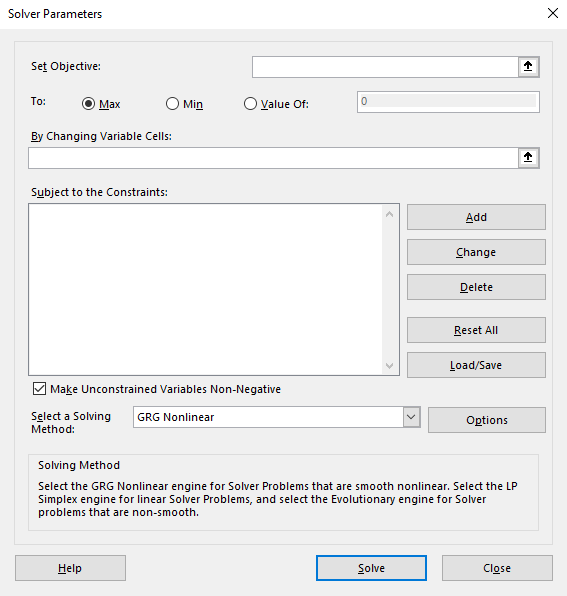 You will find the Solver Results dialog box shown in the following figure. Click OK, you are done with your result. The following figure shows the results that are produced by Solver. It shows the product mix that generates $12,365 in profit and uses all resources in their entirety, except for glue. Solver determined how to use the resources to maximize the total profit of a company. You know any other ways of making a resource allocation model with Excel solver? Please put your thought in the comment box. This example is taken from “Excel 2013 Bible” by J. Walkenbach.